Sherwood Pictures, the moviemaking ministry of Sherwood Baptist Church in Albany, Georgia, has done it again. Courageous joins the collection of the riveting Sherwood Picture movies – Fireproof, Facing the Giants, and Flywheel. As law enforcement officers, it’s second nature for these four brave men to protect and to serve. Yet, taking a step forward as fathers and building a God-filled relationship with their families is even more courageous. When tragedy strikes, these fathers quickly discover that they desire to be more than a “good-enough” father. Together, they make a pact, a resolution, to keep each other doubly accountable and to take a courageous step in their lives. 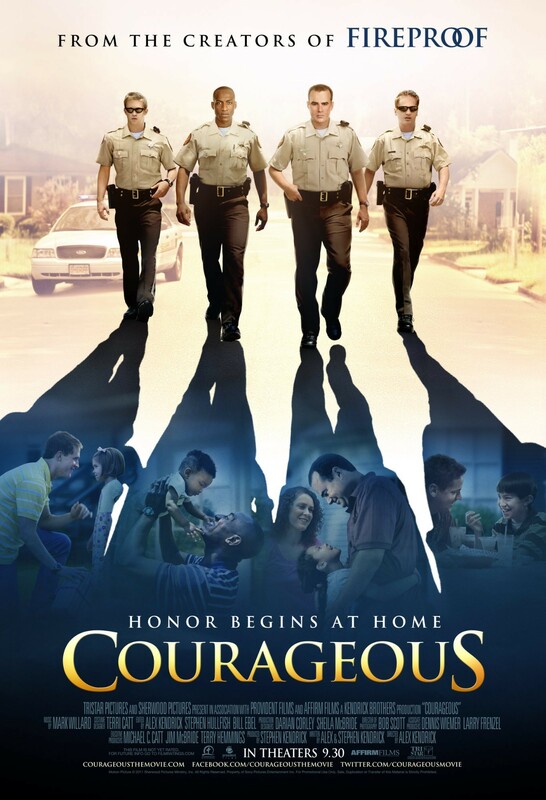 Courageous portrays these four men with strengths, weaknesses, and emotions, going through a time of sorrow, joy, failures and successes with their wives, children and friends. Movie viewers will be able to connect with at least one of the characters in the movie. This action-packed police drama brought the entire theater audience to a roller coaster of emotion. One minute we burst out in deafening laughter; the next second we sniffled and wept; and the following moment we gripped our seats so tight that our knuckles turned white. My dad usually tends to hold his feeling back, but this movie allows space for emotional expression. For someone like me who has never seen my dad cry before, it was quite riveting to see him reduced to tears. My dad told me that he has never laughed and cried so much in a movie. We were both really touched and inspired, leaving the movie theater with a new set of glasses, allowing us to see the fatherhood and family relationships in a different perspective. Courageous will enflame people to take action. Fathers will strive to become courageous and strengthen relationships with their families. Young people will desire to have a better relationship with their dad and learn to appreciate their dad’s sacrifices. Wives will be motivated to endure the hardships along with their husbands while cheering them up. Fathers, take your families to see Courageous. Take a stand, hold on to the wheel, make an everlasting resolution, and say, “I will.” For ages 10+. Posted on October 1, 2011, in Movie Reviews and tagged alex kendrick, christian drama, courageous, david thomson, father, sherwood baptist church, theater audience. Bookmark the permalink. 2 Comments. Cassandra, I am so glad you did a review on this movie. I am, or probably was if its still on theater, hoping to watch this movie soon. I am so glad you still have your christian spirit in your hobbies. This is a great movie. Thanks for the recommendation Cassandra.